Growing up in rural Wisconsin, roughly 100 miles from the nearest big city (Minneapolis) didn’t provide the greatest formative opportunities for an artist. His high school had no art department, and he had to hide his drawings under other pieces of paper to make it look like he was doing homework in study hall or risk getting punished. Ironically, thanks to a particularly creative teacher, the punishment for goofing off in shop class, where he learned to make furniture and other useful objects, was to read poetry. Brouillard took his budding interest in shaping physical, three-dimensional, utilitarian pieces from clay and majored in art at the State University of Wisconsin, where he earned his B.A. in 1969. Then a couple of years in the U.S. Army showed him a different side of life, and one that, while interesting, wasn’t one he cared to pursue. 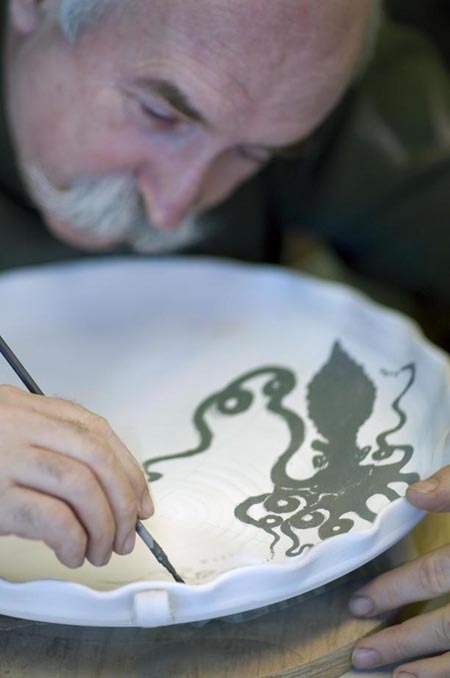 So, when he found himself studying clay at the New York State College of Ceramics at Alfred University in Alfred, New York— another one stoplight town—he thought, “Man, this is really the life. All I have to do is work on stuff I want to work on.” A ceramic artist was born. After collecting his M.F.A. in ceramic art in 1976, he was a resident craftsman at The Penland School of Crafts in Penland, North Carolina, until 1978. He then ventured out on what turned out to be another favorite track in his career, working his way through several teaching jobs before joining the faculty of the Cleveland Institute of Art in 1980. Today, he is a professor of Art in the ceramics department. He divides his time between his classes at CIA and his “job” at Brouillard Studios in Tremont in the shadow of the old steel mills and industrial structures he treasures, working exclusively on the stuff he wants to do daily. Currently, his work is represented in the collections of more than 15 centers, including the Cleveland Museum of Art, the Detroit Museum of Art, the University of Southern Illinois, Tokyo National Museum, and Lerner Tower at University Hospitals’ Case Medical Center. He has also won numerous grants and awards, such as an Excellence in Design Award from the American Craft Museum, and CIA’s Schreckengost Award for Teaching. The versatile and prolific Brouillard works in a variety of traditions. One of his shows, for example, included a Palace Art Pot, an object historically crafted to depict the wealth and power of the Palace’s owner; a fish platter, a staple of the Neo Arts and Crafts Movement of the 1950s and ’60s; and a pun platter, a visual and verbal pun inspired by California’s ceramic Funk Movement, that showed Brouillard’s wry sense of humor. “I like the way an object looks, with its profiles, silhouettes and contours,” Brouillard concludes. “So, I’m very particular about how objects are conformed and proportioned, and my work tends to be structured with a certain amount of geometry to it.” And, he might have added, a little joy.